17 February till 2 March Johan Stam was in the Middle East to attend the 7th meeting of the ROPME sea area hydrographic commission in Oman. He was invited to give a presentation about latest developments in the Skilltrade Hydrographic Survey Category B Course and e-learning platform. 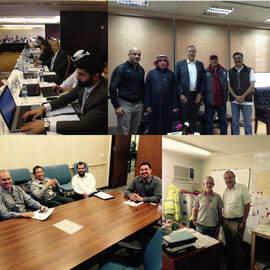 Furthermore he traveled to Kuwait, to visit the hydrographic department who are interested in our training courses. He visited the Saudi Aramco hydrographic department and explained latest updates on training. In Bahrain he met Phil Harrison, chief surveyor Abu Dhabi Marine Dredging Company SPC, currently working on reclamation areas north west of Bahrain.